We have traveled to a lot of places in the past couple of years, but it was a visit a to my childhood home that prompted a recent excursion to Mt. St. Helens with my kids, ages 8 and 11. Actually, they were right. I was alive during the volcano’s last big eruption, but I was a toddler, so I don’t remember the actual event. I do remember my parents telling me sometime later about ash falling on their home located about a 3-hour drive south of the volcano. Much has changed since Mt. St. Helens’ last major eruption and it is amazing to see how nature repairs itself. If you want to visit Mt. St. Helens, here’s some helpful information gleaned from our visit. Mt. 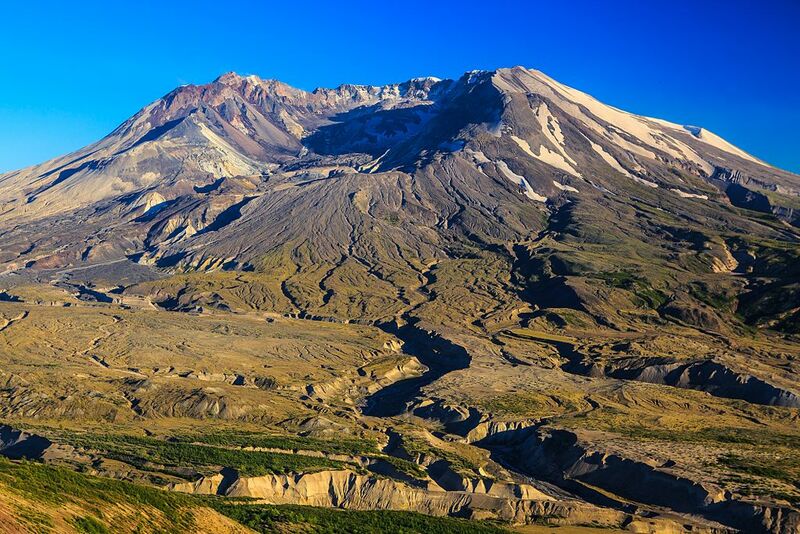 St. Helens is located in Skamania County, Washington, about 50 miles northeast of Portland, Oregon. It is considered one of the most active volcanoes in the United States’ Cascade Mountain range. Mt. St. Helens has periodically released steam and ash plumes in the past 20 years, but is most known for its devastating eruption on May 18, 1980. 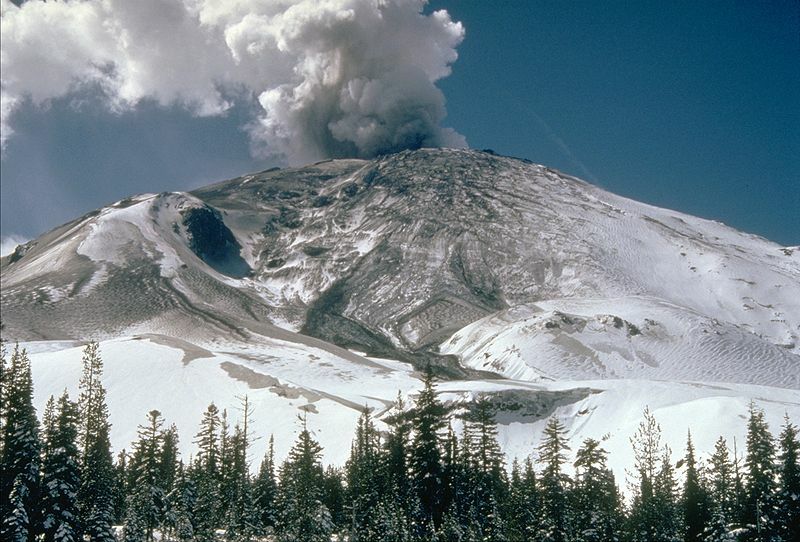 The 1980 eruption killed 57 people. It also destroyed 250 homes, 47 bridges, 15 miles of railways and 185 miles of highway. Officials estimate the blast killed approximately 7,000 big game animals and 12 million hatchery fish. The national monument designation was given to Mt. St. Helens and the surrounding vicinity after the 1980 eruption in order to protect the area and allow scientists to study the volcano. Ideally, you should visit Mt. St. Helens National Volcanic Monument on a clear, sunny day so that the volcano, in all its glory, is fully viewable. Since Washington and Oregon are known for being rainy, this can be a bit of a gamble unless you’re visiting in the middle of summer. 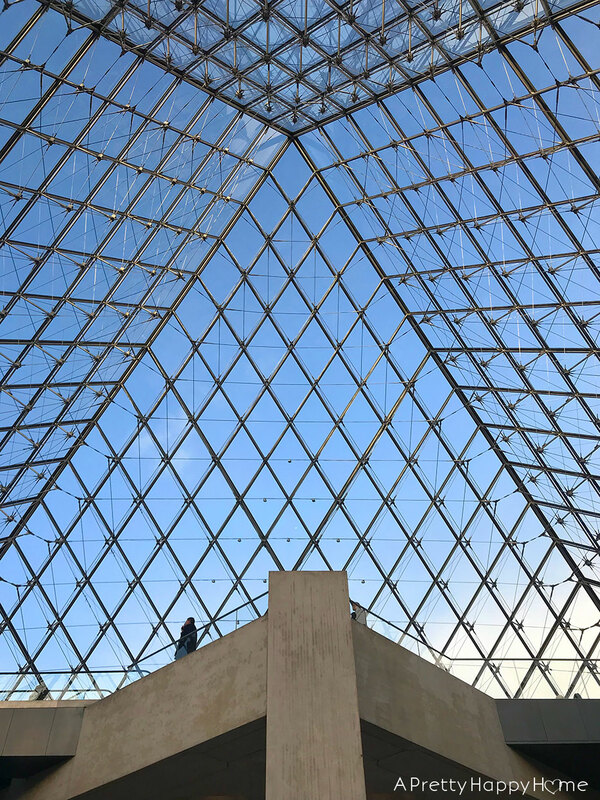 If you don’t have the luxury of planning your visit around the weather, don’t worry. There’s still a tremendous amount to learn and experience even if visibility isn’t great. Plus, the drive through the mountains (as long as the roads aren’t closed for snow) is gorgeous. So let’s go into this excursion with a glass half full mindset, okay? First, you need to know there are multiple visitor centers and viewing points within the Mt. St. Helens National Volcanic Monument area. You don’t have to stop at them all to have a well-rounded experience, but you may want to if you’ve got all day to fill. The Silver Lake Visitor Center is about 5 minutes off I-5 (the major highway connecting Washington and Oregon). The forest rangers described this visitor center to me as one focused on the historical aspect of what happened with the volcano’s eruption. However, don’t tell them, but we learned plenty about science and geology too! 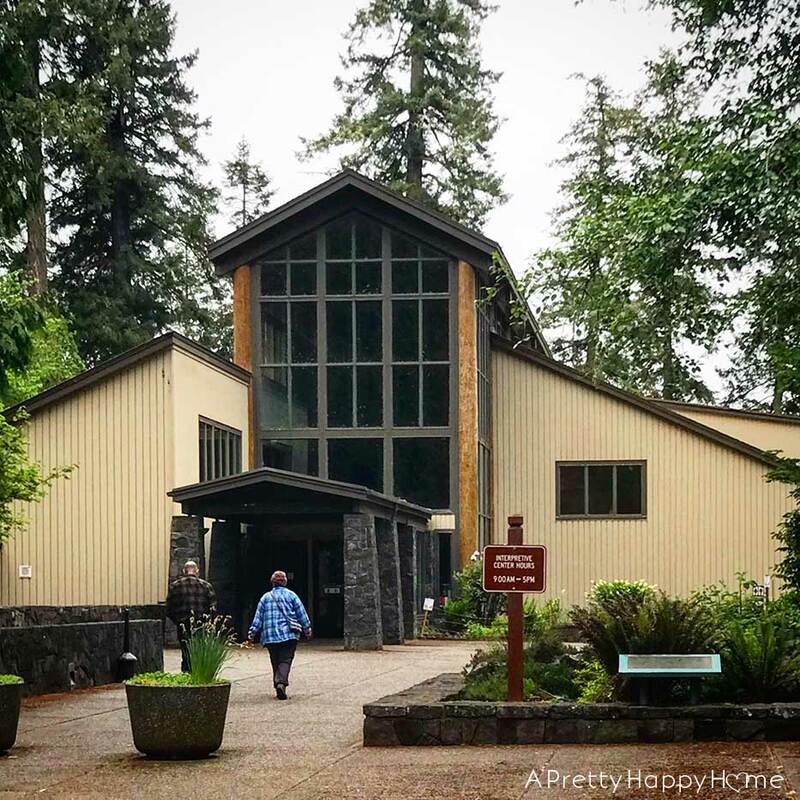 If you don’t have a lot of time or don’t want to venture too far off I-5, this is the visitor center you should tour. We spent about 90 minutes at the Silver Lake Visitor Center, including our time spent walking on the outdoor trail. There’s a short, 13-minute video, which you should take the time to watch. It gives a great overview of what happened during the 1980 eruption, including actual video footage. Definitely sit toward the back of the theater though because the video footage is grainy. It will make viewing a bit easier on the eyes. There was a lot to see and touch in the visitor center, so this is a great place for kids and curious adults. 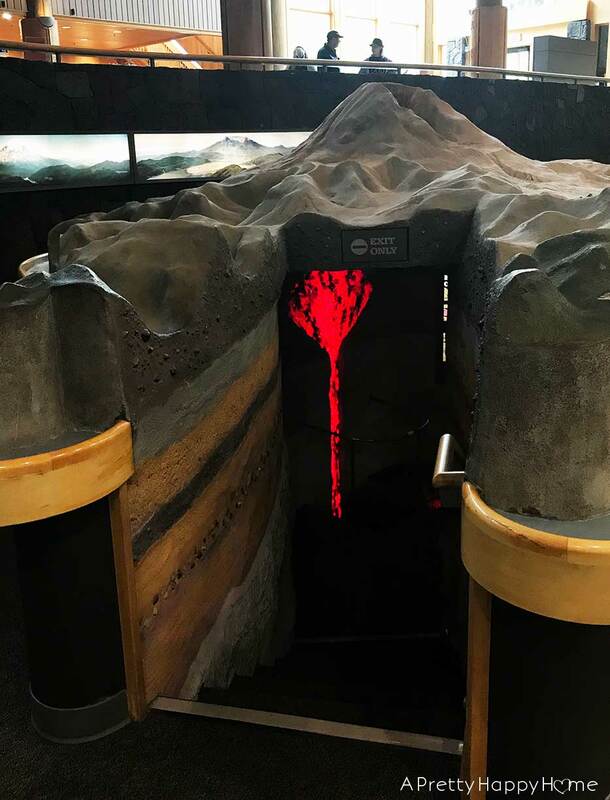 My kids loved going inside the model volcano and learning how certain animals and plants survived the blast. Admission for adults is currently $5. 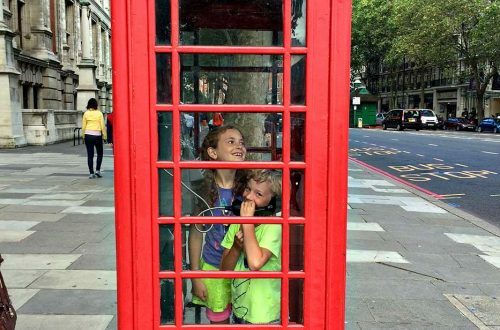 Admission for kids ages 7 – 17 is $2.50 each. Also, don’t be surprised if your kids beg you for a bottle of souvenir volcano ash from the gift shop. 47 miles from the Silver Lake Visitor Center is Johnston Ridge Observatory. The rangers described this visitor center to me as geological-focused, but more important, it has an incredible view of Mt. St. Helens. If you have a lot of time, a full tank of gas and want an up-close view of the volcano, Johnston Ridge Observatory is where you need to head. The visitor center at Johnston Ridge will give you a full overview of what happened in 1980. There are hands-on exhibits too, but the real star of the show is outside. Bring your walking shoes because there are plenty of outdoor paths to explore to see and learn about Mt. St. Helens. It’s from this area that you will have one of the closest views of the volcano and its crater without having to actually climb up to the crater’s rim. Some of these paths are paved for easy access too. There is an $8 admission fee to go inside the observatory, but I believe kids are free. This YouTube video has a great overview of the visitor centers in the Mt. St. Helens National Volcanic Monument area including one I haven’t mentioned yet, the Science and Learning Center at Coldwater. The video’s focus is on handicap-accessibility, but the information is handy for anyone visiting the area. If you’re traveling with babies that need a stroller, this video will be helpful for you too. If you’re curious about what is happening right this second on Mt. St. Helens, the US Forest Service has a couple of web cams set up. Click here. Check the Forest Service website before you go to make sure the visitor centers and roads are open. Opening days and hours vary by season and by visitor center. Also, I’ve found the links on these government websites don’t always load, so you may need to Google for a direct link. Even though there are a few communities along the way, you’re headed into a forest with lots of miles between you and a gas station. No one wants to stress out about running low on fuel, so fill up before you head out. You can drive through the national monument area and use the outdoor areas of the visitor centers without paying any fee. Phone coverage may be spotty on the mountain depending on your carrier. There are bathrooms at the visitor centers. Educational resources are available online. Mt. St. Helens’ 1980 blast changed the landscape of the area dramatically. Not just on the mountain itself, but in the lakes and waterways below the mountain too. What’s even more incredible, in my opinion, is how nature, almost immediately, started repairing itself. This may be what you notice most on your visit, but if you look closely, you’ll be able to see evidence of the volcano’s damage too. We learned so much from our visit to Mt. St. Helens National Volcanic Monument and I’m happy we went. If you are spending time in Oregon or Washington, I definitely recommend taking a day to explore Mt. St. Helens. Specific source information for this article was taken from our visit to the mounument, USDA Forest Service and Wikipedia.